If you weren't at the photo-op, here's a recap. On July 19, in the mid-afternoon (Pacific Daylight Time), NASA's Cassini probe captured a picture of the Earth and moon from 900 million miles away at Saturn. NASA took advantage of Cassini's projected passage through the shadow of Saturn to take a color image of home without the sun getting in Cassini's high-resolution eye. And, being a well-timed and expected event, they let us know about it in advance -- affording us the opportunity to become part of photographic history...sort of. Our instructions were to run outside at the appointed time, turn to Saturn's position in the sky and wave for one big group photo of humanity (or the 20,000+ who actually looked that way and smiled). 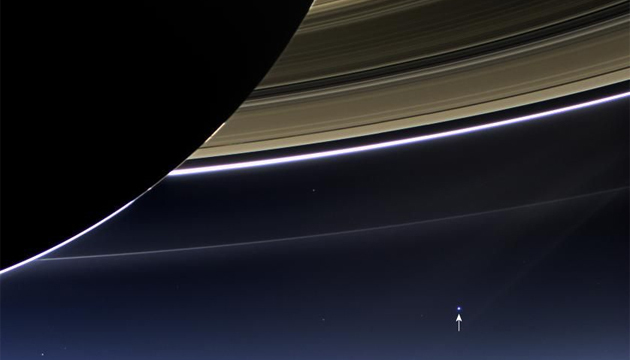 Don't worry that at Cassini's great distance, Earth isn't even as large as a camera pixel in the shot; enthusiastic posers can revel in the knowledge that we can pinpoint exactly where we were and what we were doing at the time the picture was taken. This photo-op event was pitched to us as a chance to run outside and do something fun and historical, in concert with like-minded enthusiasts all over the world and to put the Earth and moon into a perspective we don't usually think much of: all of humanity and life as we know it are living on a mere dot in space. What it did for me, however, was to remind me that Cassini is still out there exploring the distant reaches of the solar system. So, what has Cassini been doing lately? The first spacecraft ever to dwell in the Saturn system, Cassini arrived almost a decade ago and has spent the years in sweeping orbits whizzing past Saturn's rings and its many moons. It uses high resolution imaging and chemical analysis to bring us a wealth of knowledge. Early in its mission, Cassini also launched the European Huygens probe onto the surface of Saturn's largest moon, Titan. It found a frigid environment wet with mud, weather, river systems, lakes, and seas -- the wet provided not by water but methane. Titan is also suspected of possessing subsurface oceans of water, deep beneath the outer crust of the moon. Though no frosty geysers have been observed to flag this ocean's existence, measurements by Cassini of the deformation of Titan by Saturn's gravity show characteristics consistent with the crust floating on a liquid layer. And more recently, Cassini has revealed that the tiny moon Dione may be active as well. It's spewing water plumes in a weaker version of Enceladus' geysers, again suggesting a possible subsurface watery ocean. Being composed in large part of ice, these Saturnian moons certainly have the water to provide for these suspected oceans. It only takes a source of heat energy -- such as tidal flexing by Saturn's strong gravity -- to melt it. So as you look at Cassini's Earth portrait and admire your good looks, take a moment to think not of the photograph, but of the photographer -- a robot photographer on a decade-long assignment a billion miles out in space!